Is there a color requirement for ADAF regarding bicycle helmets while in uniform? I can’t find anything in the 36-2903 or any of the AF transportation manuals. They just say you have to wear one on base. There’s guidance to wear bright reflective colors but nothing specific to helmet colors. My sons on campus and after buying him a rather expensive (but red in color) bike helmet he’s being told it has to be black if worn in uniform. 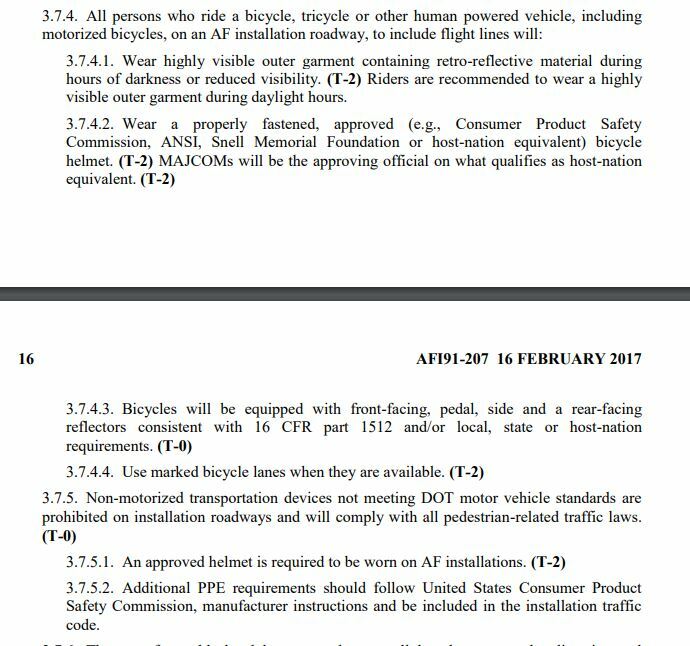 If would appear AFI 91-207 governs the wear of bicycle helmets. the ultimate approval authority on what can be worn. And no ear buds/headphones while riding a bike in uniform. Or even just walking around. That's a given. But some people figure "I'm on a bike" or "I'm on my motorcycle." Walking with earbuds while in uniform is viewed as unprofessional with a lack of situational awareness. Waking with earbuds while on a vehicle is considered unsafe. That's how you get hit by another vehicle, or you hit someone else. Some units even prohibit wearing earbuds and headphones while walking around in civies on post. It was a no-no at NAVSTA Newport.